The kit includes sixteen highly recognizable high-quality photographs of everyday items used by young children. Each photocard has the word on the face of it, phonographically coded, and in large bold font. Each card comes with the corresponding sound cards for teaching the phoneme and code for that sound in rapid progression within the context of real word identification. Directions for the lessons for using the kit accompany the set. Words are chosen based on developmental speech patterns. 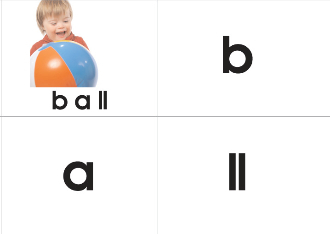 This set includes cvc, vcvc, and cvcv words. Recommended ages: 4-7 and special needs. Recommended frequency: 3-4 times weekly for 20-30 minutes. Recent studies --Phonological awareness and Phonemic perception in 4-year-old children with delayed expressive phonology skills, Susan Rvachew, et al Effect of phonemic perception training on the speech production and phonological awareness skills of children with expressive phonological delay, Rvachew and Nowak Phonological awareness intervention for children with childhood apraxia of speech, Moriarty and Gillon-- suggest that phonemic awareness training improves not just reading and spelling, but also speech production in children with expressive phonological delays and apraxia of speech. At Read America's Chrysalis School and Praxis Education Center we've also had tremendous results improving quantity and quality of speech output using a system of phonemic awareness training that employs Errorless Learning, known to be effective with children on the autistic spectrum, and our own procedure Directed Reading, known to be effective with very young children and children suffering from Central Auditory Processing Deficit.